The opposite of a golden age is a dark age. When it comes to design and visual imagery, I believe we are living in a dark age. The last dark age was the 1970’s. I sometimes like to go to the Plaid Stallions and laugh at what people thought was cool back in the 70’s. From today’s perspective it is pretty embarrassing. Back then we did not really notice how bad it was, but it seems the further away we get from it, the worse it seems. But that is the nature of fashion. It was only 10 years ago that super low jeans and backless halters were in, and already those are uncool. Time makes fools of every fashion trend. I believe we are in a new dark age of design today, and can prove it, by pointing out how bad the supposedly trendy “fresh, new, and modern” trends coming out today already look like crap — no test of time needed. Lets start with the new Superman movie Man of Steel coming out this weekend. Above are two versions of a promotional picture. One is the original, one has the colors blue-shifted and increased the saturation 10%. Which movie do you want to see? 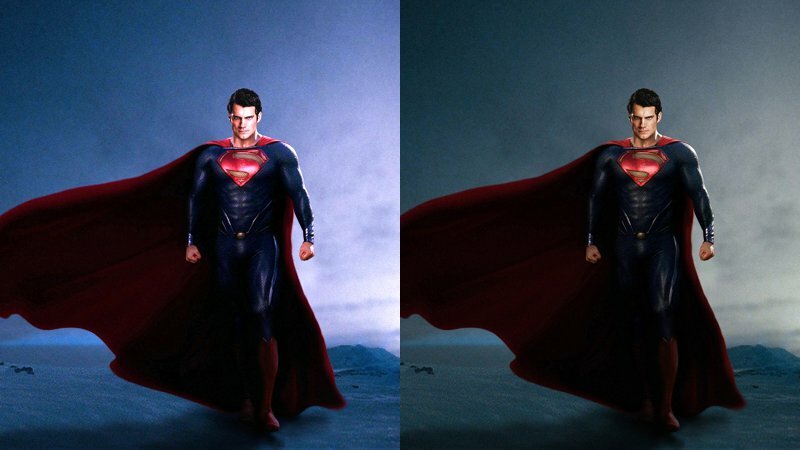 The main color of Superman’s uniform is BLUE, and yet the film makers go out of their way to avoid using the color blue anywhere in the movie trailer, and I expect the entire movie. They are not alone. The supposedly visually stunning The Great And Powerful OZ has the same problem. Even though there seems to be a lot of blue in it, it is actually all shades of teal. Are film makers purposely avoiding the color blue for some reason? Meanwhile, in the world of software design, especially operating systems, we have the exact opposite problem: too much color. I have already pointed out how crappy Windows 8 looks to everybody who does not have a master’s degree in design, which is at least partly responsible for its poor sales. But then Apple decides to Windows 8ify its popular iOS used in iPhone and iPads. Like Windows 8 look, it is flat, it is simple, and it is ugly. 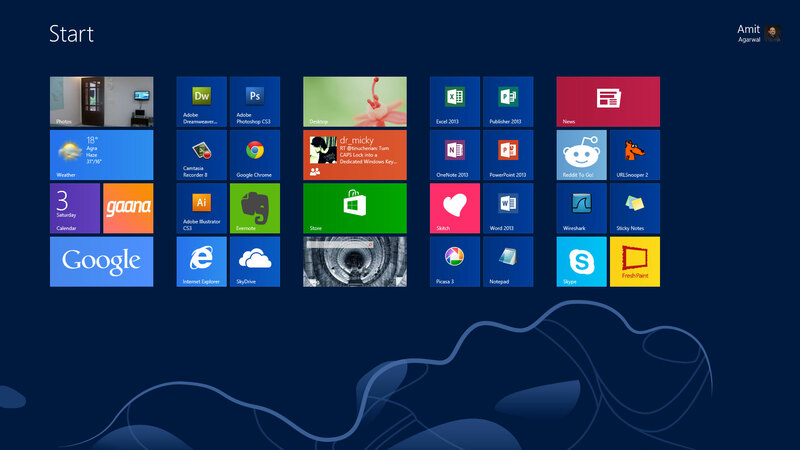 To make themselves different from Windows 8, they added gradients, which looks even more ugly. I am not alone in my assessment, there is a whole Tumblr page dedicated to software designers complaining about the look of iOS 7. This is the baby of Apple hardware designer Jony Ive who in this embarrassingly bad video explains his design philosophy, which works great in hardware design, but fails miserably when it comes to software interface design. The problem is that there is a lot of functionality changes in iOS 7 which are actually pretty good, and probably a good reason to upgrade, the automatic app upgrades are my favorite change, but who wants to stare at that screen? Who indeed, especially when Apple realizes that one of the big selling points of iPad was the cool looking main screen sitting on display next to the generic looking Android cousins. iOS 7’s redesign takes that marketing advantage away, and now the iPad looks just as generic as the cheaper android tablets. I predict iPad sales this holiday season to be just as disappointing as Windows 8 PC sales were last holiday season. The smartphone’s greatest problem today isn’t teaching people that there’s a virtual space for doing everyday tasks. Rather, it’s teaching people that they no longer have to use their computers anymore. The functions of phones themselves are growing even as the actual size of a phone screen is approaching its natural limit. Smart phones have, in many ways, exceeded the metaphors that used to define them. Thus, in order to do more complex interactions on the screens, and to keep those interactions uncluttered, you have to strip down the design language. Windows 8 was a redesign of the OS with touch screen as the primary input tool. It never seemed to cross anyone’s mind at Microsoft that desktop computers do not work as touch screens. Did they really think that we want to lift our arms, reach over our keyboard do hand gestures on the surface of our monitor screen, sometimes for long periods of time when we are doing visual design work? Our arms would get freaking tired in a matter of minutes doing that, when it is so much easier to use a good old fashioned mouse with an ergonomic arm rest. We didn’t spend our youth pumping quarters into arcade machines developing master hand-eye coordination skills just to have them go to waste because “touch screens are COOL”. Touch screens on desktop computers are not cool, especially in the work environment which accounts for around 80% of desktop computer usage. OS design for desktops needs to reflect that model, and while Windows 8 is useable with keyboard and mouse, it often feels awkward like using an up and down scroll wheel to move the screen left to right. Hence Windows 8’s poor sales. iOS 7’s redesign seems to be inspired by the belief that people will start using their phones for more than just phone calls, taking pictures, listening to music, and flinging angry birds as unsuspecting pigs. They want your tiny phone screen to be a medium for actual productivity. Tablets make more sense in that regard, but even they are going to fall short of that goal. It did not seem to cross anyone’s mind at Apple that the sole functionality of phones and tablets are: 1. playing media, 2. locating media to play, and 3. making media portable and useable anywhere. That and making phone calls. Any functionality outside those three categories and you are better off with a PC. Writing this blog post would take me at least twice as long to do on a tablet. It can be done, true, but takes more effort. The hard truth is: The only time tablets become productivity tools is while sitting on the toilet. I know what you tablet fans are thinking: “If tablets are so useless, how do you explain tablet sales outpacing PC sales?” Easy. 1.) only a small percentage of home users use their computers for productivity, most people have computers for nothing more than surfing the web and watching videos, activities that are perfectly doable on tablets, and 2.) activities that are also perfectly doable on 8 year old Windows XP computers, so many people have no need to upgrade. Bad OS design is the result of a flawed mentality that this OS will be used everywhere and for everything. This same flawed mentality is the root cause of the horrible design decisions behind the XBox One which wants to be the one and only box you need connected to a dumb monitor, even though smart TV’s are all the rage these days taking away the need for most of the extra functionality in the XBox One (whose starting price is higher than a smart TV). But that is another complicated topic. Bottom line: Good design is all about form and functionality, true. The bad designs we see today are the result of corporate mindsets that completely misunderstand what the actual form and functionality are. Overuse of color correction in movies is a form mistake, the movie equivalent of auto tune and needs to die like shaky cam and auto tune. Oversimplification of software interface is a functionality mistake. Next Article What makes a GEEK? True. When I watched with horror the roll-out of Windows 8, I thought, “This is going to be bad…” Now Apple is doing the same thing, and I wonder if they are in competition of falling the hardest face-first. I don’t understand where all the fascination of touch screens comes from. It’s really a fundamental concept that the more basic your input mechanism, the more basic your application is going to be. You have to spend several times as long writing a touch-screen accessible GUI to have the same capabilities as you would a traditional keyboard and mouse one. Just the same, you have to spend several times as long coming up with a mouse GUI to configure your application as you do one that works off the terminal and text files, hence the flexibility of UNIX/Linux servers as compared to Windows servers. Sure there are times when all you can use is a touchscreen, but the tradeoff is in flexibility and design cost. There’s a happy medium somewhere in between where most of the “productive” computing happens. Hollywood has been color grading films to highlight orange and teal for about ten years now.